Yep, H’s shirt is finally done. As I mentioned in the blog hop post, just about everything that could go wrong with this did go wrong. I have sewn just about everything twice (at least). I probably could have ironed it before I photographed it. 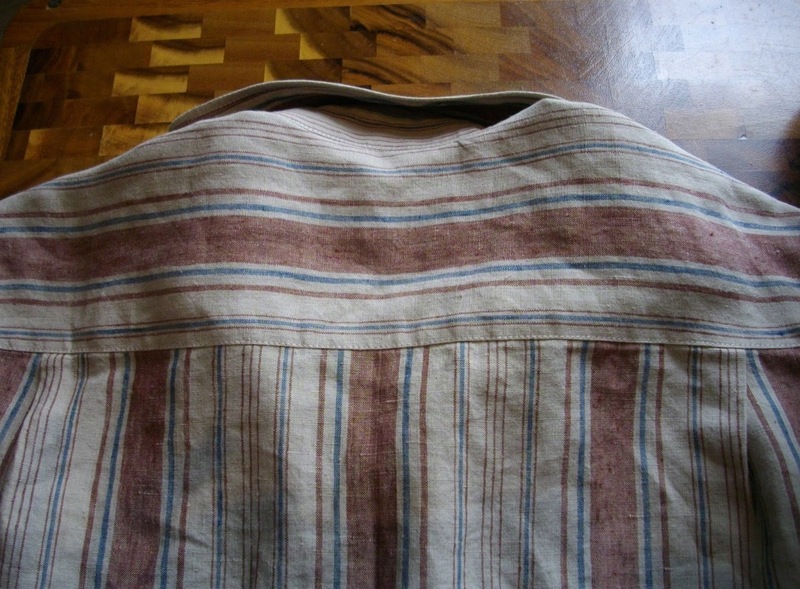 But it is linen so this is probably how it will usually look anyway. Like last time, I used the free pattern Lekala 6207. 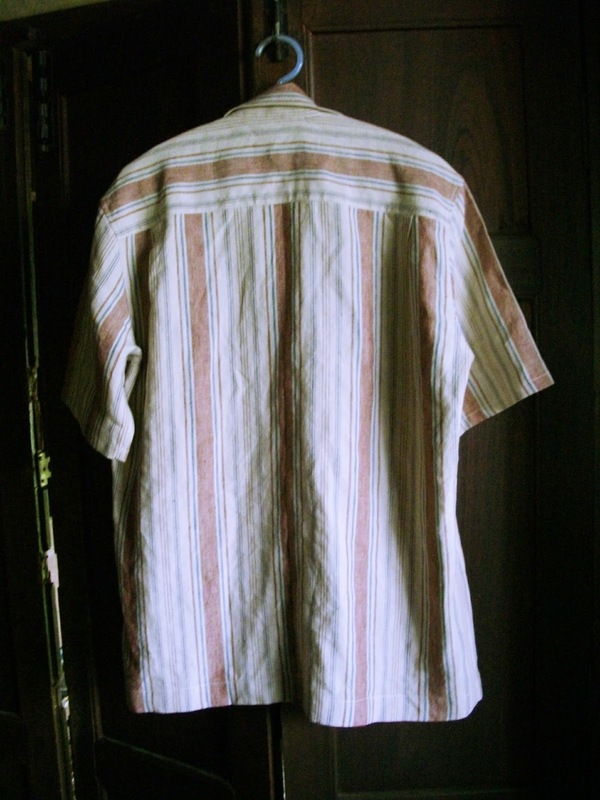 Last time I narrowed the shoulders and it fit better, but H requested an exact copy of a RTW linen shirt and so this time I left it as per the pattern. I also drafted a new collar based on the RTW – as is, it is quite large. So what went wrong? Well, the first thing to go wrong was the thread. Yes, the thread. I happened to have a matching thread already but it must have been at least 20 years old. And it kept snapping. Said thread is now in the bin. I wish I had read this excellent post by La Sewista before starting on the shirt and I wouldn’t have had this problem. Also after reading that post I decided to try her do-not-backstitch idea (you just dial down the stitch length instead) and I must say I am impressed. Actually the whole NLS (Next Level Sewing) series are worth a read. So the problem with the thread snapping was that it is on the topstitching of the pocket. So I had to unpick that and being quite loose weave linen it really didn’t like the extra attention. It stretched a bit. Which is why my previously pefectly matched stripes ended up a teensy bit off. So the next thing to go wrong was the side seams. 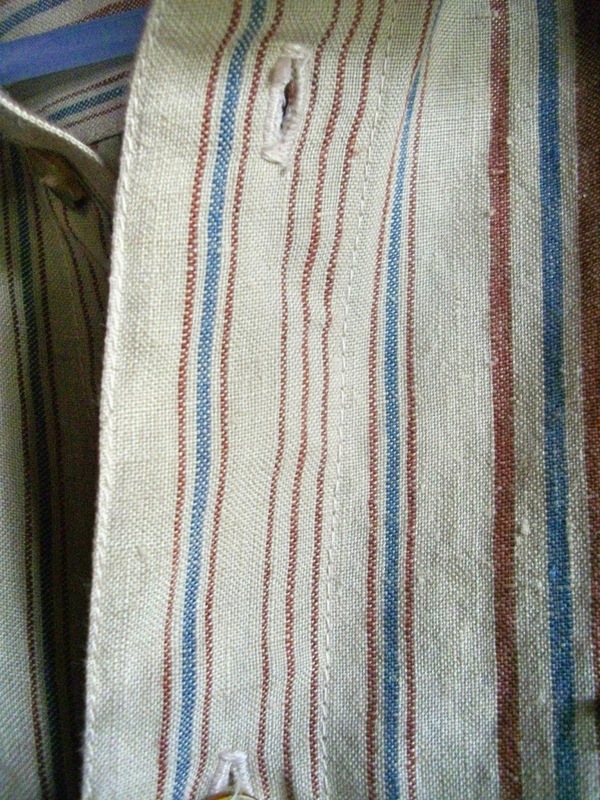 I flat felled them but somehow when pressing before the final row of stitching, I pressed in a crease of excess fabric. On both sides. And didn’t notice. No, I don’t know how either. Then came the abomination that was the first collar and stand. I, as always, used this excellent tutorial by foursquarewalls which constructs and attaches the collar in a different (and more logical) order. The problems with the collar were entirely of my own making. When I was doing the collar I hurt my lower back. Bending down to put something in my handbag which was on the couch would you believe. I mean seriously, I have no idea how or why just bending over hurt it – but it did. So sitting in any one position for any length of time was uncomfortable. But I had determined that I would have the shirt finished for H’s birthday so I kept sewing for too long. And all the sewing I did was rubbish. But somehow my pain addled brain thought it was ok at the time. When the pain cleared the unpicking began. So moral of the story – if you can’t sew, don’t. As I said previously both the collar and stand looked ok as long as you didn’t look at both sides at once as both were very asymetrical. Because I had enough fabric I just chucked the collar and stand in the bin and recut both. Let me tell you, attaching a collar stand on an already trimmed and clipped neckline is not easy. 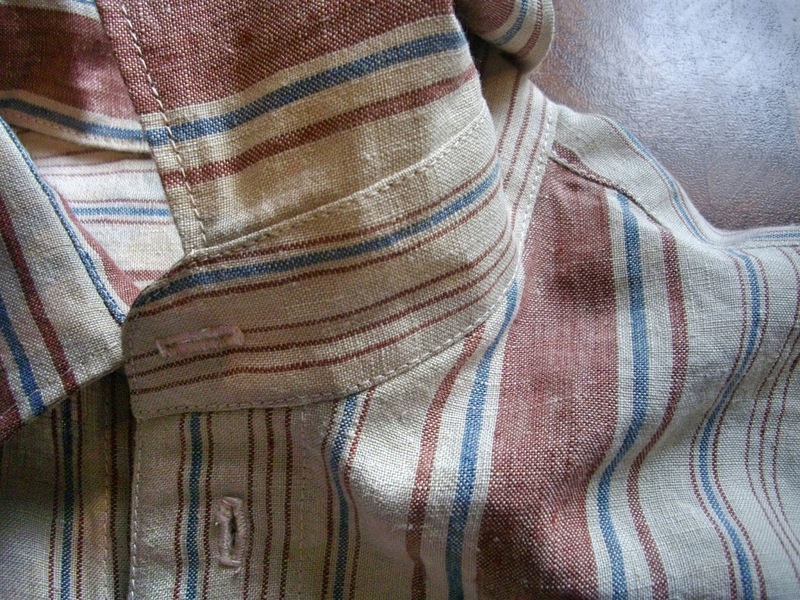 I also had to redo the topstitching on the front placket because the first attempt was far from straight and even. Fortunately I did the yoke properly the first time. 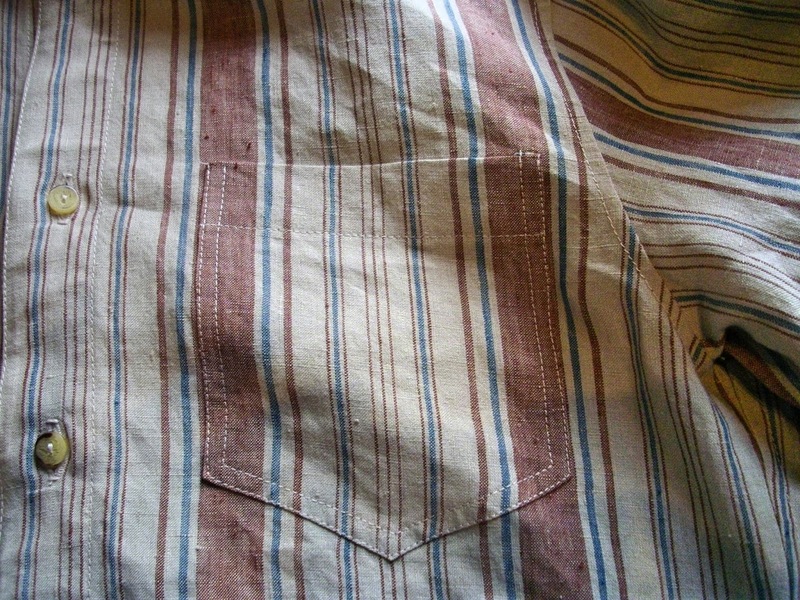 I cut it on the crossgrain so that the stripes ran horizontally. And I changed the one centre pleat to two smaller ones nearer the shoulders because H prefers them that way. I should point out that H did suggest several times that I just leave this and sew something else but I feared that if I left it, it would be a UFO forever. I am now very glad that I persevered. 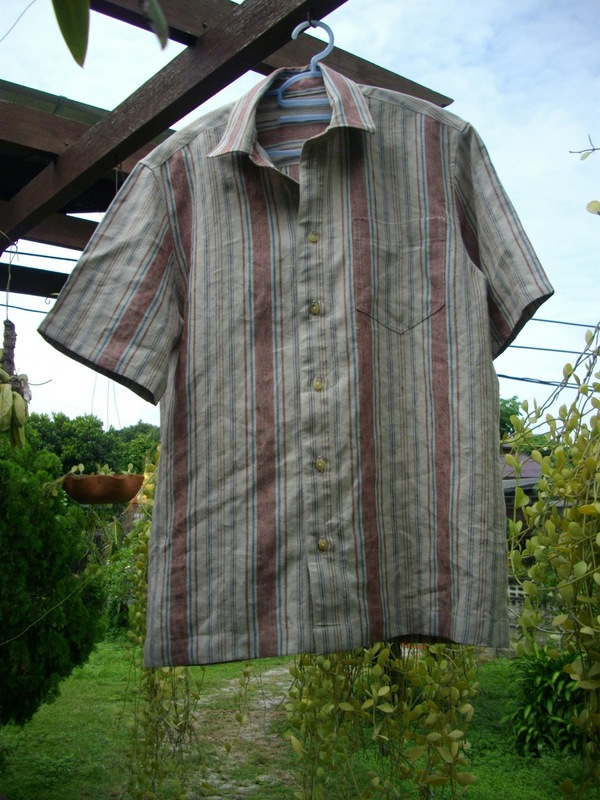 So I recommend the Lekala pattern if you fancy making a shirt for the man in your life. Although if it’s your first man’s shirt you may find the instructions somewhat lacking. But with the many excellent tutorials available around the internet you shouldn’t have too much trouble. And I do really recommend the collar tutorial, you really should give it a try. Next time I’m going to use one of the many collar point tutorials and see if I can improve them. What about you? Do you have any favourite men’s shirt tutorials, tips or suggestions? Gaye, I think the shirt is fabulous and H must be so proud of you. I think you are a little too hard on yourself but I must admit that learning to sew does involve re-doing some things if they're not quite right rather than letting it go. This is how we learn to be better at what we do. It's the striving to perfection that makes it such a rewarding hobby. If I look back at the first shirts I made [I keep them to remind me!] I am appalled but looking at the most recent I can see how far I've come. You've done a brilliant job and the close up pictures show it. Awesome collar & stripe matching! I use a shorter stitch length to start & end seams too. Sometimes! It varies according to whether I think I'll need to unpick the seam or not. Good on you for keeping at it. So worth the effort. But he is thrilled with it. Good tip about the smaller stitches at the start of a seam. Thanks very much Jan. I do find that I am now much more likely to unpick and redo rather than letting it go. Perhaps because I am now more confident that it will be worth the effort. And you're right it is nice to see how far we've come. Thanks Accordian. I'm sure I had read about using shorter stitch length before but for some reason this time it clicked. And I do like it – although I have had a few seams with quite a lot stitched very short. Thanks a lot Louise. Yes, he is pretty pleased and he is very appreciative so it always make it worth the effort. I don't know why I've never tried the shorter stitch length before – I've certainly heard of it- but I am impressed so far. Shirts have always been land of mystery to me so I always admire the ones who actually dare to start one. Most of my tries (if not all) ended up in disaster. This one looks great. stripe matching perfect, what can you ask for more? The little things nobody else sees other than you are the little secrets that make you smile when looking at it. Instead of backstitching try to let it run for a few stitches without moving the fabric forward, then push back gently, stitch one, pull forward gently, stitch one – you're done. Should work with all stitch lengths, unless your machine objects when the presser is not down. Thanks very much. I actually like making shirts – not sure why – but I find it immensely satisfying. Thanks for the alternative to backstitching idea – I will give it a try. WOW!! This shirt came out amazing. Great work girl! i wish my collars came out as nice as the one you just made here! Love it! Before I did it this way the ends of the collar stand were usually a mess. Give it a go.